There are many reasons to visit Italy: great food, incredible art, architecture, shopping and romantic hotels with scenic views. Here is a collection of specials in Italy that range from golf getaways and cooking classes to romantic and honeymoon escapes. Some of the most popular Italian cities are Venice, Rome, and Florence in Tuscany. Points of interest include art, architecture and beautiful countryside throughout the country. 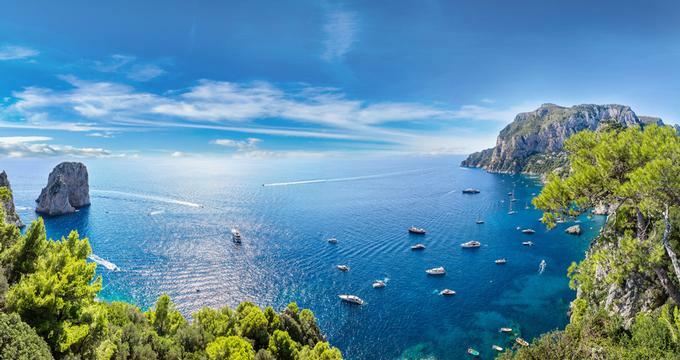 Visit the scenic Alps or islands like Capri and Sardinia. Kids are especially welcome at most hotels in the country. In some places you will find packages designed specifically with families in mind, offering free dining or a gift for children. Here are some ideas for families in Florence. The Gritti Palace is a luxury hotel with a rich historical legacy in Venice. An elegant building, the palace was constructed in the 15th century and served as the residence of the noble Gritti family. Today, it showcases 21 unique luxury suites. The hotel is currently offering A luxury Spa escape. The package presents a welcome drink at Bar Longhi on arrival. Guests can indulge in one of the most blissful spa experiences with a couple’s massage at Acqua di Parma Blu Mediterraneo Spa. The package also offers complimentary breakfast every morning, high speed internet, and VIP local amenities. Belmond Hotel Cipriani is located on Giudecca Island in Venice, Italy. The hotel features spectacular views of the Doge's Palace and the lagoon. The hotel offers elegant accommodations with traditional décor featuring local artefacts and modern amenities that include classic dining options and a heated Olympic size pool. The hotel is currently presenting the Suite Dreams package. Guests receive a discount of 20% on the standard rates when booking a night at this luxurious hotel. The package offers luxury accommodations and a buffet breakfast every morning. Included is à la carte dinner or lunch every day, but beverages are not part of the package. PalazzinaG is an elegant 5 start hotel in Venice. Overlooking the Grand Canal, the hotel offers easy access to the famous attractions of the city. The hotel is offering the Long Stay Special: 7x5 promotion. The package offers a minimum stay of seven nights in one of the luxury rooms or suites, and guests receive two nights complimentary stay when booking for seven nights. The package offers continental breakfast every morning. Included is a welcome drink and free Wi-Fi. The rates exclude the city tax fee of € 1.50 to € 5.00 per person, per day. Hotel Danieli is a legendary hotel in Venice, Italy offering the Fashion Shopping package. Guests will benefit from an exclusive partnership with several stores and explore the Noventa di Piave designer outlet. With more than 100 stores offering discounts of up to 70%, guests will have a fantasy shopping holiday. The package offers double room accommodations in Hotel Danieli and American buffet breakfast every morning for two. Included is a welcome cocktail at the hotel bar and 1,000 bonus Starpoints®. Guests receive complimentary shuttle bus and hotel pick up services and an extra 10% at participating shops. Guests are also welcomed with a glass of Prosecco at participating shops. Villa d'Este is a luxurious hotel overlooking Lake Como in Italy. Villa d'Este is offering the Romantic Stay package. The package offers a three-night stay in an executive room with a garden or park view. Guests receive a full buffet breakfast at the restaurant, or they can order in-room for a continental breakfast. Included are flowers and Italian Spumante in the room on arrival and a welcome gift. Guests receive three 3-course meals at the Veranda where a formal jacket and tie is required, or guests can opt for the Grill Restaurant – beverage is not included. The package also offers access to sport facilities at the club. VAT, city tax, and service charges apply. Rates start from 1152 Euro for a double room per person. Hotel Santa Caterina is an elegant seaside villa in Amalfi Coast, Italy. The hotel is offering the Family package. Included is daily buffet breakfast, free Wi-Fi, and family film rentals from the DVD library. The package offers airport round-trip minivan transfers from Naples Airport or the train station. Included is one guided day trip tour to Ancient Greek Temples in Paesturn and the archaeological museum and one-day tour to the Roman ruins of Pompeii. Guests also receive one entrance ticket for a tour of the paper mill museum Amalfi with paper making. Guests receive one pizza making class for the family at a local Pizzeria and one babysitter for one night, so that parents can enjoy a romantic meal at the Santa Caterina Restaurant. Rates start from 1665.00 Euro per seven-night stay, and VAT and city taxes are extra. Grand Hotel de la Minerve is set in a spectacular mansion from the 1600's located in Rome, Italy. Overlooking the Pantheon and offering easy access to the Spanish Steps and the Trevi Fountain, this aristocratic hotel features modern amenities. The hotel is offering the Special Weekend Rate package. Guests receive an American buffet breakfast. The rate is based on two-night stay and must include either Friday, Saturday, or Sunday night. The package offers a check in time of 3 pm and a checkout time of 12 noon. Principe di Savoia is a landmark hotel in Milan, Italy. They feature opulent rooms and suites with modern amenities. The hotel is offering the Upgrade your Suite Offer. Included in the package is a guaranteed free upgrade to the next level of suite experience at the Principe di Savoia. Guests also receive car service to and from the historical center. Included is access to the beauty center and Club 10 fitness, which offers an indoor swimming pool and Jacuzzi. Rates start from €500 in Ambassador Junior Suite. Villa La Massa is a luxury hotel that overlooks the Arno River in Italy, and it is now offering Cooking Classes in the Heart of Tuscany. This package provides guests with an opportunity to take a three-day Tuscan gastronomic adventure that includes cooking lessons in the hotel's kitchen. The package offers three-night accommodation in a Deluxe or Double Prestige room. Guests receive buffet breakfast at the restaurant. Included is a bottle of wine, a welcome cocktail, and two morning cooking classes with lunch and beverages. Guests also receive a farewell dinner at the Verrocchio Restaurant, free access to the Arno Spa and jogging track along the Arno river, a cook booklet, and a cooking gift. Rates start from 1000.00 Euro per person. Taxes apply. Cristallo Hotel Spa & Golf is a historic hotel located in the pristine town of Cortina, Italy. The hotel is offering A Retreat in Well Being package, where guests will have access to the services of a lifestyle trainer. The package offers a grand buffet breakfast and half board with dishes specially suggested by the health coach. Guests will receive a complete nutritional evaluation by the health coach, who will also assist you with daily indoor activity. The package also offers shuttle service to and from Cortina city center. Rates start from 1,120.00 Euro per room. Belmond Hotel Caruso is a restored 11th century palace that stands on the cliffs beside the Amalfi Coast in Italy. The hotel is offering the Sensorial Journey package for guests to rejuvenate and indulge in a range of spa and wellness treatments. The package includes luxury accommodations and a daily buffet breakfast. Guests receive welcome amenities and €300 spa credit per room, per stay. Included are two meals at the hotel's restaurant, but this does not include beverages. The package is for three nights, and spa credit cannot be redeemed for merchandise. Charming House is an elegant hotel in Venezia, Italia. The hotel presents a cosmopolitan ambience with modern amenities. The hotel is offering the Gourmet Venice package for guests to get an insight of this historic city. The package offers two nights of accommodations. Included is a visit to the glass factory in Murano where you can learn about the venetian art of glass blowing. Chiara Bocchini, the owner, will book a table for a romantic dinner in one of the city's best restaurants, at either Ristorante Osteria di Santa Marina or Ristorante Linea d’Ombra. Belmond Villa San Michele is a beautiful boutique hotel nestled on a hilltop in Florence, Italy. Tracing its history to the 15th century, the hotel reflects the classic beauty and décor of a Renaissance monastery. The hotel is offering the Family Rate package. Guests traveling with a family will receive 30% discount on the parent's room and a complimentary room for children up to 14 years old. The package offers luxury accommodations and daily American breakfast. Included are children's amenities like in-room toys and a pizza-making demonstration. The San Domenico Palace Hotel is a luxury hotel located in a historic Dominican monastery in Sicily, Italy. The hotel is offering the Gourmet Experience package. Guests will learn hands-on Sicilian cooking with Executive Chef Massimo Mantarro. The package includes two nights of accommodations and an American buffer breakfast every morning. Included is a welcome Sicilian aperitif and a chef's apron. Guests receive one lunch at Le Bougainvillées restaurant and one dinner at the two Michelin starred Principe Cerami Restaurant. Included is a visit to the local market with Chef Massimo Mantarro and a hands-on experience cooking class where participants will make typical Sicilian dishes. A recipe signed by Chef Massimo Mantarro, complimentary Wi-Fi, and round-trip transfer to and from Catania Airport are also included. Mezzatorre Resort & SPA is an exclusive 5 Star Hotel on the island of Ischia, Italy. The hotel is offering the Special Escape package. Included is accommodations in a Standard Double Room for double occupancy and a buffet breakfast every day. The package offers one complimentary entrance per person per day to the wet zone of the spa, which includes indoor pools, a sauna, a relax zone, and the Turkish bath. Guests also receive access to the gym, outdoor heated sea water swimming pool, sun terraces, tennis court, and jogging paths. Shuttle service to and from Lacco Ameno is also included. Rates start from 146 Euro per room, and VAT and service charges apply. Hotel Brufani Palace is a luxurious hotel in Italy. A popular destination, the hotel offers both opulent and modern accommodations, and they are now offering the Special Celebrations package. Included is accommodations in a suite for two nights and breakfast served in-room every morning. Guests receive an Italian sparkling wine and a welcome gift on arrival. Included in the package is a candlelit dinner, excluding beverages. Guests receive access to fitness center, sauna, Jacuzzi, and pool, and they also benefit from free Wi-Fi and a late checkout of 4 p.m. VAT and city tax apply. La Posta Vecchia Hotel is a historic retreat located in Rome, Italy. The hotel is offering the Gourmet Fantasy package. Included are two nights in a double standard room and a buffet breakfast every morning. Guests will receive a flute of champagne and a fruit basket in the room on arrival. Included is one seasonal 3-course dinner served at Cesar Restaurant and one 6-course tasting dinner served at the same restaurant, beverages excluded. The package offers a room upgrade on arrival (subject to availability) and a guided tour of the Chef's vegetable garden. Rates start from €514 per person. Aquapetra is a luxurious resort in Sannio region, Italy Aquapetra currently offering the Chistmas in Aquapetra package. The package offers accommodations for two. Included is a buffet breakfast that serves organic produce and fresh baked products. Guests will receive a complimentary soft drink from the guest room minibar and free access to the fitness center. Included is a cooking class with the Chef and a three course Christmas Eve dinner in the charming and serene atmosphere of La Locanda del Borgo, excluding beverages. The package also offers Holy Mass at the church of the village. Rates start from 550 Euro per night for a classic room. Hotel Villa Belvedere, an elegant hotel overlooking the Bay of Naxos in Italy, is offering the Excursion package. Included is a double or twin bedded room that looks out onto spectacular views of the sea from the balcony. Guests receive a buffet breakfast every morning. The package offers a one-day excursion of choice for two people to Syracuse or Agrigento and Piazza Armerina or Etna – this excludes ascent to the main crater area. Guests also receive one full lunch for two at the pool-side restaurant, and drinks and service charges are extra. Rates start from 1050 Euro per person for 5 nights, which excludes VAT and taxes. Palazzo Sant'Angelo is a beautiful hotel in Venice, Italy. The hotel is offering the Unforgettable Romantic Escape. The package includes a welcome Venetian gift and a bottle of champagne. Guests will also find a bed full of rose petals on arrival and a buffet breakfast every morning. The package offers a private gondola tour along the Grand Canal from the private pier. Included are tickets and a welcome drink for two at the Venice Casino. The couple can enjoy a romantic three course menu dinner and beverages at Antinoo's Lounge & Restaurant. A minimum two night’s stay is required. Taxes apply. Hotel Sorrento is an elegant hotel located in the center of Sorrento, Italy near the main square of Piazza Tasso. The hotel is offering the Dream Three Nights in Sorrento package for guests to have an unforgettable holiday in this charming city. Included in the package is a discount of 10% on the superior double room with a balcony that overlooks the Piazzo Tasso and dinner in one of the most popular restaurants in Sorrento, allowing to experience the flavors of the Sorrentine cuisine. Guests also receive two complimentary passes to the spa to rejuvenate after a day exploring the attractions. The package also offers a welcome drink on arrival, complimentary Wi-Fi, and a breakfast buffet.